Arguably the most iconic symbol of Lisbon, the Torre de Belém – Belém Tower – rises majestically from the Tagus River. Originally built as a lighthouse, the tower went on to be used as a fortress under the orders of King Manuel I 500 years ago. The UNESCO World Heritage-listed building is beautifully designed and I spent hours admiring the filigree stonework before climbing the narrow spiral staircase to the top. From here I was rewarded with spectacular views over Belém and the river. 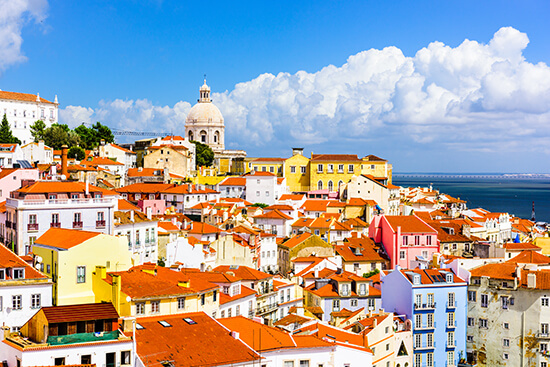 Lisbon’s oldest neighbourhood is bursting with a labyrinth of narrow cobblestone streets which wind up a steep hill overlooking the Rio Tejo. The charming district is also one of the only areas to be spared in the earthquake of 1755. As I made my way up through the lanes, I passed colourful houses with tiled balconies, beautiful churches and traditional trams. I also stopped to marvel at the various viewpoints which open up to reveal Lisbon before you. The Miradouro de Santa Luzia was my favourite and I sat for some time beneath the cascading bougainvillea while admiring the sweeping views over Alfama. Don’t miss the chance to ride the famous Tram 28 while you’re here, which will slowly pass through many of Lisbon’s finest districts. It will also take you to the top of the hill if you want to save your legs. 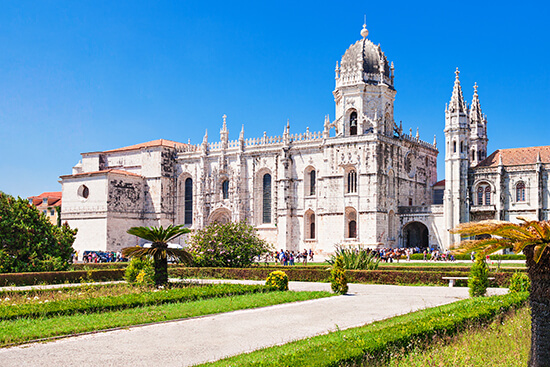 One of Lisbon’s greatest historic landmarks, this UNESCO-listed monastery is a real work of art. Originally populated by monks of the Order of Saint Jerome, it became an orphanage and school after it was built in 1502. The cloisters are breathtaking, and each one is individually designed. Significant figures in Portuguese history are entombed here, including King Manuel. After exploring the octagonal piers of the church, I made my way outside to the garden, which was laid in 1940 and consists of hedges cut into the shape of a number of municipal coats of arms of Portugal. 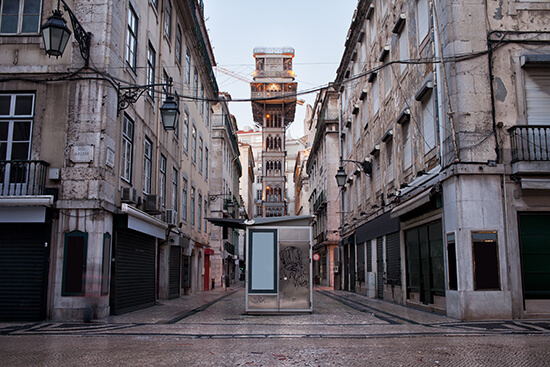 This beautifully-crafted elevator transports passengers from the Baixa district to the ruins of the Igreja do Carmo church. Prepare to be whisked up in style; the elevator is visually spectacular, with an outer ironwork structure forming neo-Gothic arches. Opening in 1902, the elevator quickly garnered a reputation as the Eiffel Tower of Portugal and a platform at the top, reached by a spiral staircase, promises superb views. Go at twilight to catch the sunset while you’re up there. OK, we may be cheating a little with this one as Cascais isn’t technically in Lisbon, but we think it’s more than worthy of a mention. Just a short 30-minute drive away, you’ll be greeted by the magical sight of golden bays and shimmering waters on arrival. Surfers will be in heaven at Praia do Guincho, and there are plenty of lush gardens and designer boutiques to explore if you get tired of lounging around on the beach. Don’t leave without dining at one of the many al fresco restaurants on the marina. I enjoyed some of the freshest seafood I’ve ever tasted at the Hemingway restaurant/bar. The first ever Time Out Market opened in Lisbon in 2014 and now attracts two million visitors a year, making it the number one tourist attraction in the city. There are so many culinary delights beneath one roof here; 34 restaurant pop-ups, to be exact. Each one has a different concept, but focuses on promoting local produce. Settling myself into one of the high benches, a quick glance around revealed regional specialities including Azeitao sheep’s cheese and award-winning custard tarts. Sushi and sashimi sat alongside some of the juiciest burgers I’d ever seen, while the next stand was serving pan-fried Azores parrotfish. I feasted on a delicious plate of fresh sushi from Confraria, which has a restaurant in the city, before pouring myself a pint of Super Bock from the bar in the centre of the market. I remember looking across at my neighbour’s plate of stuffed crab and feeling a sudden pang of food jealousy. I could easily have eaten here every night. 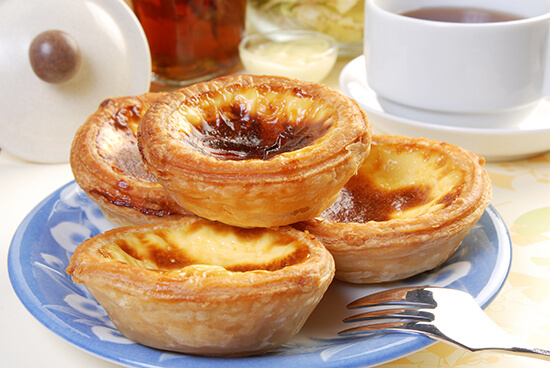 What better way to round off a scrumptious meal than with a world-famous custard tart? Yes, there was a queue outside the door when we arrived at Pastéis de Belém, but I didn’t care. I’d been told by everyone not to miss out on this taste sensation, so I stood my ground until we were finally shown a table. Inside, the bakery is huge – the corridor winds on and on, with walkways peeling off to reveal more seating. I was struck by how unassuming the bakery is inside. Decorated with blue and white mosaic tiles, it first opened in 1837 and is still thriving today. And it is easy to see why: we ordered a plate of custard tarts between us and had polished them off within seconds. Served warm with icing sugar dusted on the top, they melted in the mouth as soon as I took a bite. The original recipe is a heavily guarded secret; so sadly, I will never be able to recreate that sumptuous taste. Yet another reason to return to Lisbon! Fancy a Europe city break like Tess's Lisbon jaunt? Book an appointment to chat to one of our Travel Experts and they'll find the trip to suit you.